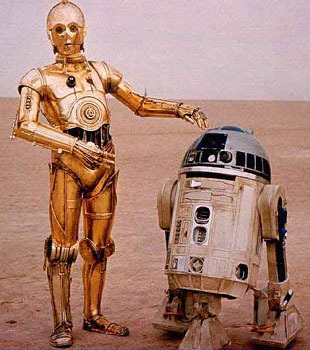 As an avid Science fiction reader, the word robotics used to remind me of two things: Isaac Asimov’s literary universe (with the famous 3 laws that he created), or the wonderfully conceived duo of C3PO and R2D2, made famous by Star Wars (contrary to a common belief, not all astronauts are fans of Star Trek…). the CanadArm can be in different configurations: an astronaut needs to be able to fly it in any condition. However, that word assumed a whole new meaning to me shortly after starting training as an astronaut, 2 years ago. My first encounter with the world of robotics has a name: B.O.R.I.S. This robotic arm only exists in the virtual world of computer based training, and all astronauts train initially on this simplified version of a real robotic arm to understand how to safely and successfully operate one. As a test pilot, I am somewhat used to operate machines of different natures (well, somewhat different). So I felt ready to “fly” the arm using its hand controllers: but to my surprise, I learned that there’s a lot more than meets the eyes when we talk about robotic arms. Even on a simple arm like B.O.R.I.S., procedures are laid out to prevent possible problems (the most catastrophic ones being inadvertent contact with payloads, structures, crewmembers) and training is required to learn the “mental gymnastics” required to understand the motions of the arm. The stakes are higher, and so are the risks, when operating an infinitely more complex robotic arm like the SSRMS – commonly known as CanadArm. 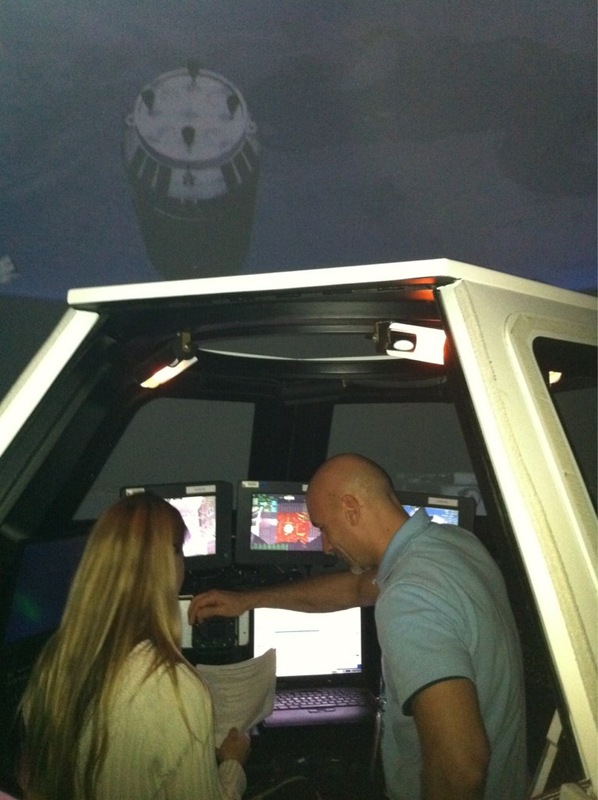 Karen and I training in the JSC "cupola" facility for robotic operations. Consequently, the training is also a lot more complex. But what is this “mental gymnastics” I mentioned? When we train to fly the Canadarm, as in space, we usually don’t have a direct view of the area of operations: we have to use cameras that give us only a partial view of the environment and the arm itself. Any image on a screen is two dimensional, so we use three different views at the same time to try and understand the spatial environment: but since the cameras are looking at the arm from different directions, the arm will move differently in each picture. Most times, the operator will not be co aligned with the arm: when he gives a “forward” command, for example, the arm may move left or right on the screens. The arm may also be in an upside-down configuration, where the motions will also be reversed… and so on. Since our hand controllers give inputs for translations (left, right, forward, backward) and rotations (pitch, yaw, roll), an astronaut needs to be capable of foreseeing the end result of his commands, regardless of the arm’s configuration. I Robot? 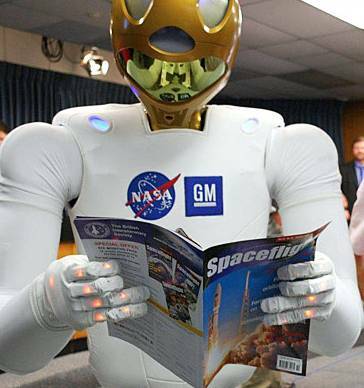 Sometimes reality beats fiction, and robots like Robonaut may in the future help with space exploration (but only after I fly to Mars!). Other difficulties come from the sheer dimensions of the arm: at about 50 feet length, any inputs will be greatly amplified when the arm is extended. So we train to fly as smoothly as we can (unlike flying military jets, where the motions can be very aggressive!) to avoid dangerous oscillations. 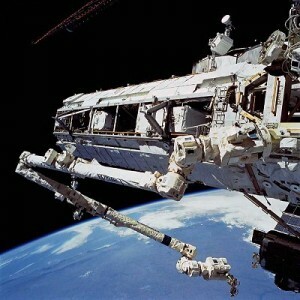 All in all, it takes over a month of intense training to qualify as an operator to fly the Canadarm. All these changes in the USA space program has caused me to reminisce on how far we’ve come. People live miles above us; we’re on our way to Mars, and we reach out and grab things in space through robotics (hopefully not crew members!). It is all beneficial to the earth world we live in. Cameras take physicians where no one has gone before, too, in just such a way. We are moving ever closer to the future, though I am secretly fearful of drones. Thanks for the lesson, and keep up the good work! Thanks for your post. I was wondering: has the Canadarms some boundaries in its moves to prevent the arm from colliding with space station structures? Not from a mechanical point but set up in the software? There are software-programmed boundaries for self collision, but not for collision with ISS structures: also, these don’t take into consideration payloads or astronauts on the arm. That’s why continuous monitoring by the operator is so important, and why “flying” the arm is such a dificult task. Thank you all for sharing you experiences on this blog, it’s really what was lacking in communications between the space agency and the general public. mi fa piacere che trovi il blog interessante. Il mio Reparto di appartenenza e` il RSV, per cui sicuramente mi trovero` a passarci per un motivo o un’altro. Per adesso sara` dificile a causa delle tempistiche del mio addestramento per il volo del 2013. A presto! So when you are on the ISS and controlling the CanadArm, is there someone on the ground in the ESA control room working as your back-up operator or is it all just you? Could the arm be controlled from different locations simultaneously? I think being an Astronaut means staying calm in so many different tense situations! E dunque Star Wars e non Star Trek eh ? Bene Maggiore, forse c’era una cosa a cui non ti avevano preparato allora : la pressione della gente, che solo perché sei un personaggio pubblico, pretende di inquadrarti in categorie soggettive e parziali, e vuole che tu ti adegui ad esse.